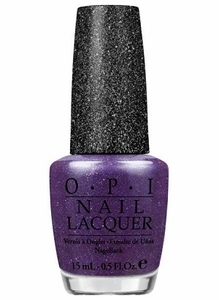 OPI Liquid Sand Textured, Matte Nail Polish, Can't Let Go, NLM47, .50 fl. oz. Rich grape purple nail color mixed with medium hex glitter and tiny square micro-glitter that dries to a matte, textured finish.